The Canadian government has said it will "spend whatever is necessary" to stimulate the country's economy in the midst of the global economic downturn. The pledge came in the opening session of parliament, which was suspended six weeks ago when a row over the budget escalated into a full-blown crisis. The minority Conservatives will present their new spending plans on Tuesday. Votes on the budget are set to start later this week. A defeat would bring down the government. Last month, Prime Minister Stephen Harper's government risked being tipped out of office as opposition parties attacked it for doing too little to tackle Canada's economic problems. They were also angered by plans, later withdrawn, to end government subsidies for political parties. Six weeks on, the Canadian parliament opened a new session on Monday with a speech focussed almost entirely on the economy and the global financial crisis. "The global credit crunch has dragged the world economy into a crisis whose pull we cannot escape," said Governor General Michaelle Jean, the representative of the head of state, Queen Elizabeth. "Our Government will spend what is necessary to stimulate the economy and invest what is necessary to protect our future prosperity," she said, as she outlined the government's agenda for the coming months. It was an unusually short speech full of concessionary language and calls for Canadians to work together as they faced "a difficult year, perhaps several difficult years". 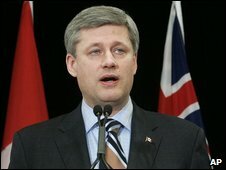 In stark contrast to their frugal approach last year, the Conservatives are now ready to present a multi-million dollar stimulus package and infrastructure fund, and are willing to run a budget deficit of more than C$60bn ($49bn, £34.5bn) over two years, says the BBC's Lee Carter in Toronto. Two opposition parties, the New Democrats (NDP) and the Bloc Quebecois, have already said they will vote against it. "Mr Harper has lost our confidence and he's now willing to propose things he doesn't even believe in, in order to save his job," said NDP leader Jack Layton. "We think there's a much better way forward, and that is for the other parties to work together in a coalition." The main opposition Liberals, who have a new leader in Michael Ignatieff, are adopting a wait-and-see approach. "We'll see whether Mr Harper has started to listen. We'll see whether he's finally got serious. 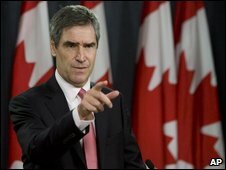 And if he hasn't learned to listen, he's not going to lead for long," Mr Ignatieff said. If the budget is defeated in parliament, the government would fall. The first budget vote is set for Thursday.